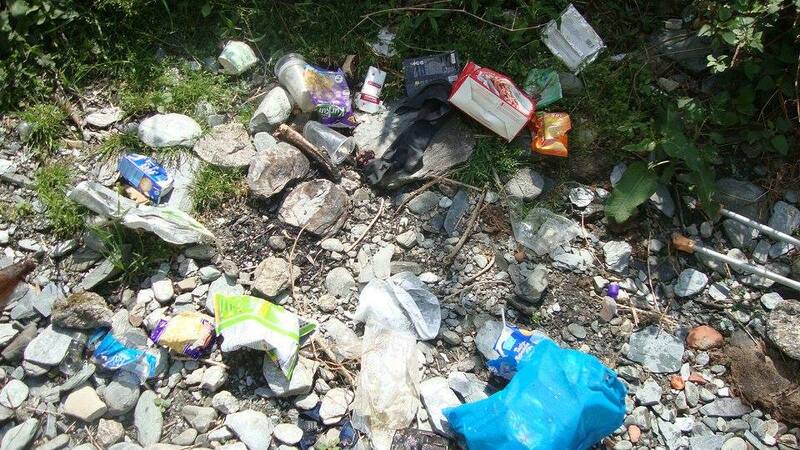 After returning from my Kareri lake trek I had seen a lot of empty liquor bottles dumped in stream, Though I couldn't bring back every stuff as I already had 15 kg with me and my feet dying to reach back at base. It was then , a hiker friend of mine told me about 'Waste Warriors' an NGO who have also established their office at Dharamshala. 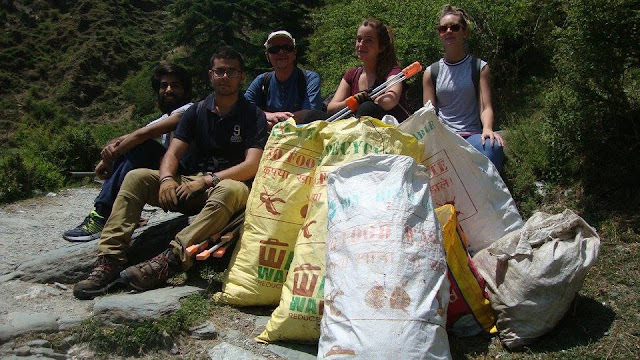 This NGO keeps the Triund trail clean every week along with the waterfall route and some children parks. 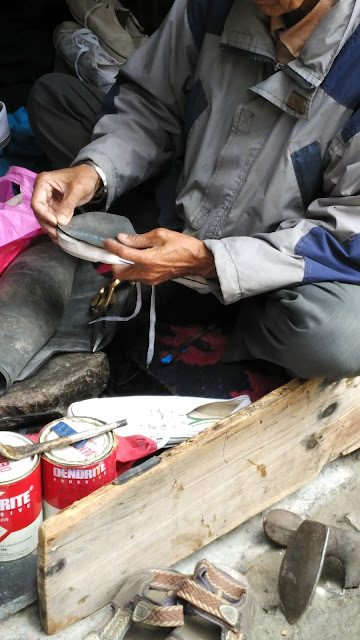 It was 21st of April,2016 when I packed my day sack at 3A.M with a litre of water and some biscuits and left for Dharamshala early morning on my bike, followed by our most favourite public transport 'The Bus' from Pathankot.I had to meet the waste warriors official at Bhagsunag temple at 10A.M so after having my all time favourite breakfast at Nick's Italian Kitchen I was very much ready for the task. 6. And of course one 'Me'. 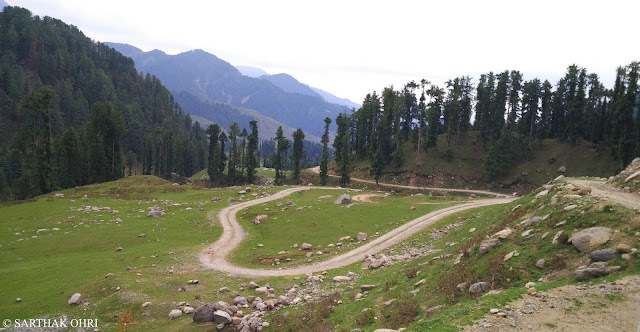 The paved route to fall had been cleaned many times and it was the stream that was untouched by warriors since a month. It was then we decided to get down and wash the waste out of stream. We wore the gloves and began picking very bit of plastic or glass we could find. It was just 10 minutes that my sack had already got full and it was getting difficult to carry it upstream. We did found some more empty sacks in the river which of course were our new bags now. There were some plastic glasses waiting for us. 4. Cosmetics and their chemicals leaking into water. 5. Wrappers, wrappers and wrappers everywhere. 8. Food wasted by tourists. 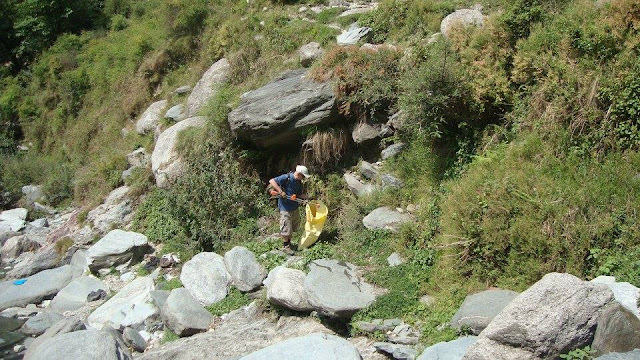 My priority was to reach those 'Not so easy to reach' areas where the waste gets accumulated everyday, like crevasse between two rocks or small caves or space under the rocks where animals take shelter during rain. And fortunately my rock climbing skills helped me do this task without getting any major bruises. 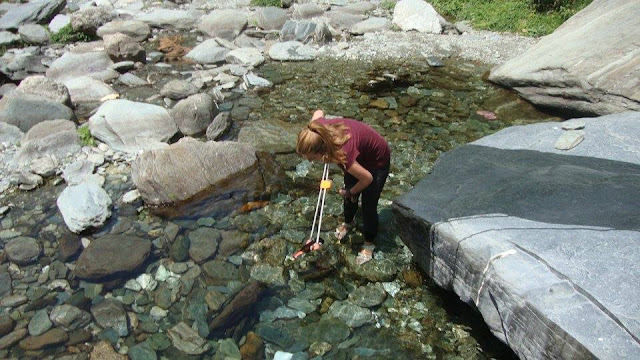 Another team mate of ours decided to enter knee deep waters without caring for her expensive sandals just to collect two wrappers of wafers.Now that's what I call 'Junoon' - the energy to accomplish difficult tasks. Nature demands love with a punch of craziness. 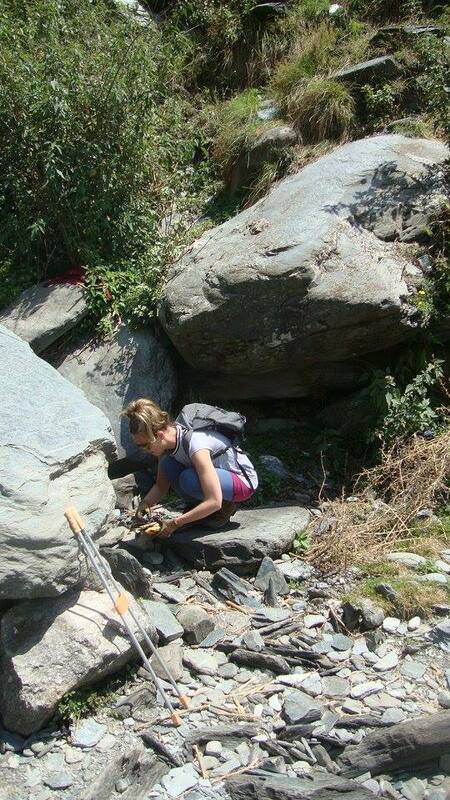 It was 12.15 and we had trekked one kilometer of stream uphill carrying some 60 kg of bags with us in that scorching heat. It was the final recce for any leftovers on the path we covered so far. 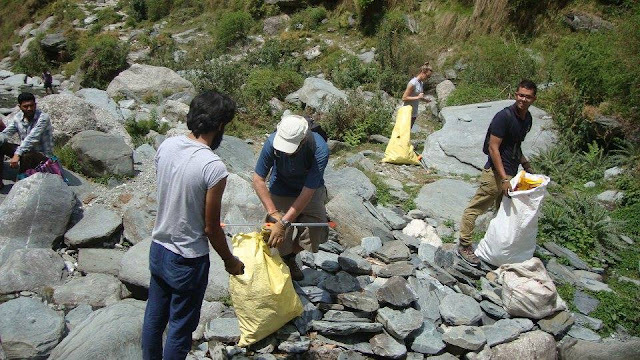 We had no more bags and volunteers to contribute with us, so leaving the last 200 meters of stream we returned back to our base having dumped our bags under a rock, which would be carried to municipality dump yard in some vehicle. I and Kelly went to waste warriors office with Sanam (official) at Bhagsu itself to discuss some future plans while others bid us a goodbye as they had some other plans. After having a long discussion with sanam and his team I could chalk out some main reasons for the accumulation of tons of garbage every week and ways to control it. #The main problem still lies in our mentality, we can see the dustbins but would never care to use it. #painting rocks for funky or even good messages can never be a good idea, rocks are natural so let them retain their original colour. #If we can carry 2 kg of alcohol uphill, why cant we carry 200 gm of empty bottles downhill. #People need to visit the villages below the stream using such water, I can now very well explain why cancer is the most common disease in India's poor population, the reason is simple, they are drinking dark water being developed by us. #Cleaning is just a way to clear the mess, we actually need to embarrass the people polluting in public so that they feel what they did. #Never break a glass bottle, a single small piece of canker can be deadly if unnoticed or thrown in water. #Be a waste warrior, not for the public, but for your home, for your society, for your colony. This can change a lot. Finally I bid them a Goodbye and moved back to town around 1.30 PM, had another favourite meal at 'The Chocolate Log' visited my favourite bookshop and the short trip ends here. P.S. - Not to mention that Sanam and his whole team were really surprised to see a soul travelling 100 km early morning just to volunteer for 2 hours. I Would look forward for more such cleanups with them. Bottles or empty packs, we gotta fill our sacks. Searching the remote places, People usually hide their waste under rocks or bushes. Great job, wish ppls will become more responsible toward cleanliness and not to abuse mother nature by littering.